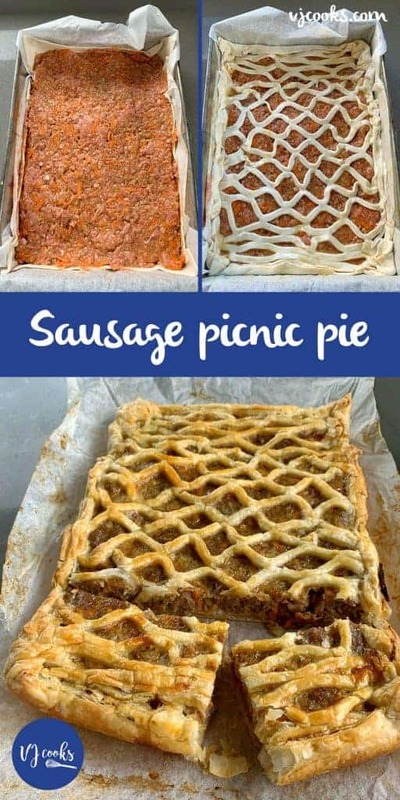 This sausage picnic pie recipe is so tasty! Perfect to take along to any pot luck meal or to whip up for mid-week dinner. 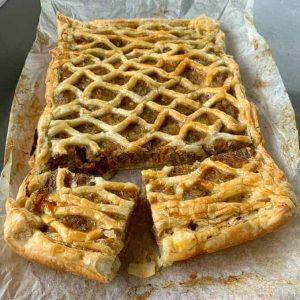 I was so happy with the results when I created this recipe, I had done lots of research online trying to find the perfect sausage tart or pie to take along to a picnic. 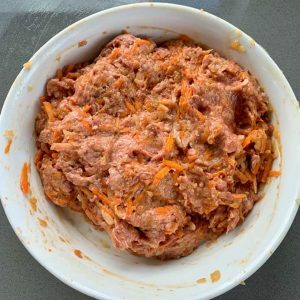 It was hard to find any recipes so I created this one and it tastes delicious. 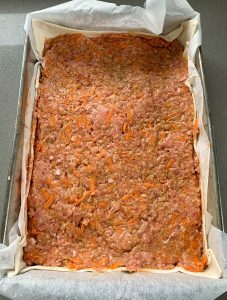 It is affordable to make and a great way to sneak veggies in for the kids. This recipe is made with puff pastry and a simple sausage filling. 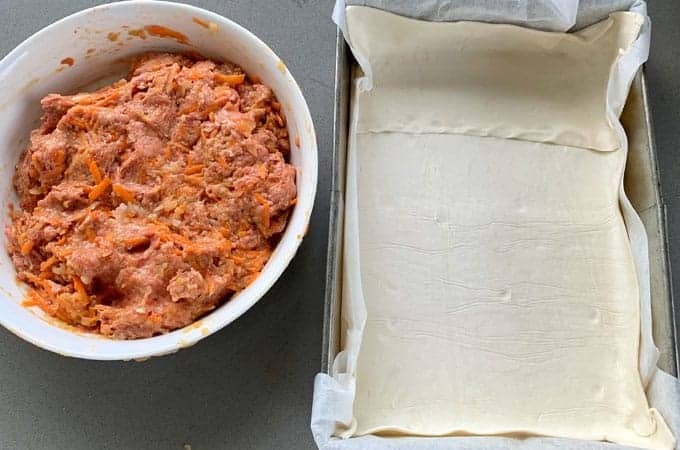 You can use your favourite flavoured sausages and remove the meat from the casing. 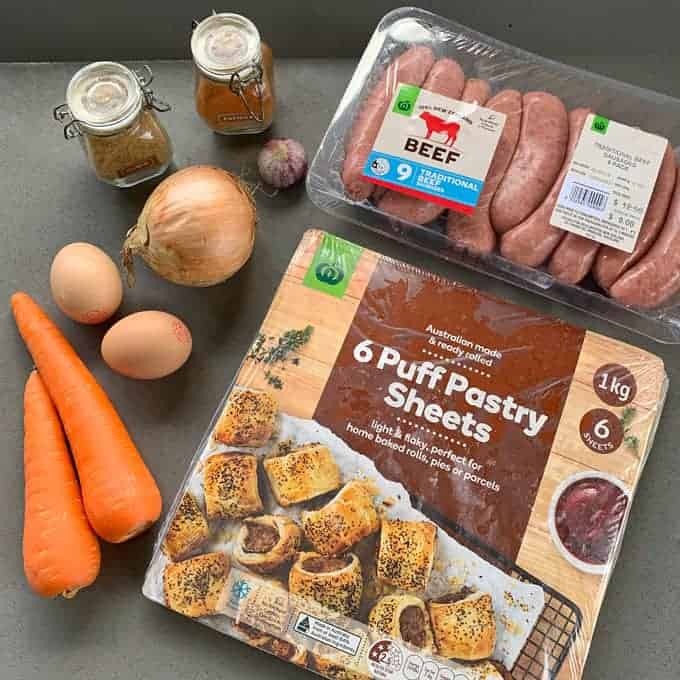 Or you can buy the 500g packs of sausage meat which are usually less than $6. 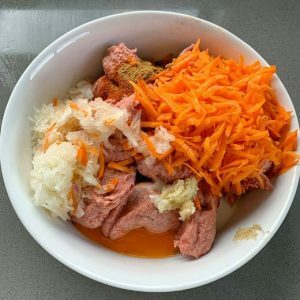 In this recipe I have grated the onion and carrot so that they end up quite small, I hate crunching on a big piece of onion. Once you have added all of the ingredients to a large bowl I find the best way to mix it all together is to use your hands. I know it feels a bit yucky but it is the fastest way. Once your filling is ready you spread it on top of the puff pastry. 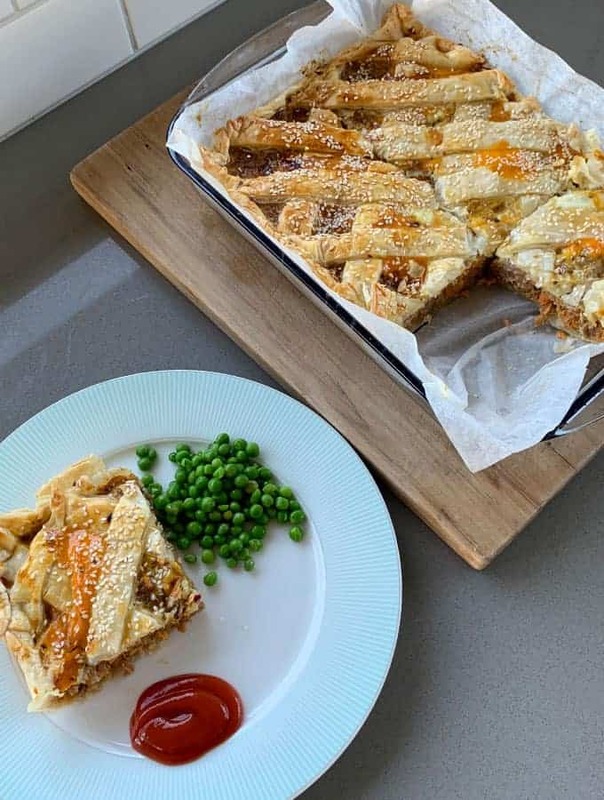 Line the baking tin with a generous amount of baking paper so that it is easy to pull the pie out once cooked. 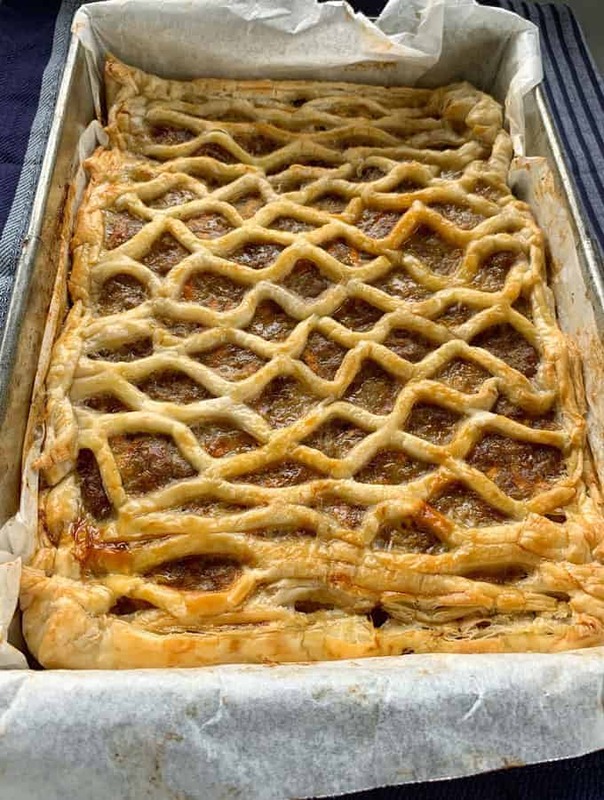 I used a nifty little pastry lattice roller to create the pattern on top of the pie. I haven’t quite got the hang of it yet so I will do a bit more practice. Before baking I did a egg wash over the pastry so that it came out with a lovely golden colour. 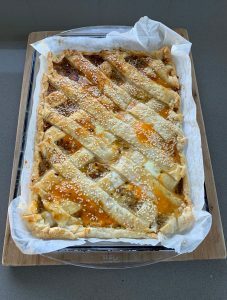 The idea for this recipe came from my Mum who said that back in the 80’s they made a pie like this that had grated apple, rice and curry powder in the filling. It sounds pretty strange to me but a few of my followers on Instagram say that it is delicious. Above are pics from my second attempt at this pie, I created 6 divots in the meat filling and added whisked egg to each one to make it a sausage and egg tart. 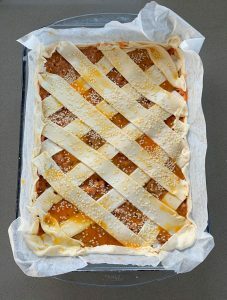 It tasted so good and for the top I just criss crossed the pastry then sprinkled over sesame seeds. Mix all of the filling ingredients together with your hands. Line a tin with baking paper then puff pastry. 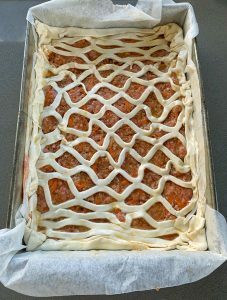 Fill with the mixture then cover the top with a criss cross of pastry and pinch at the edges. Use a pastry brush to glaze the top with whisked egg or milk. Bake for 50-60 minutes until golden and cooked through. Serve hot with a salad for dinner or serve it at a picnic warm or cold. Extras you could add to bulk it up: grated courgette, spinach, kale, finely chopped broccoli, peas, grated apple, rice and eggs.